The moment I knew I was expecting a baby, I got rather excited about the prospect of running with my child. 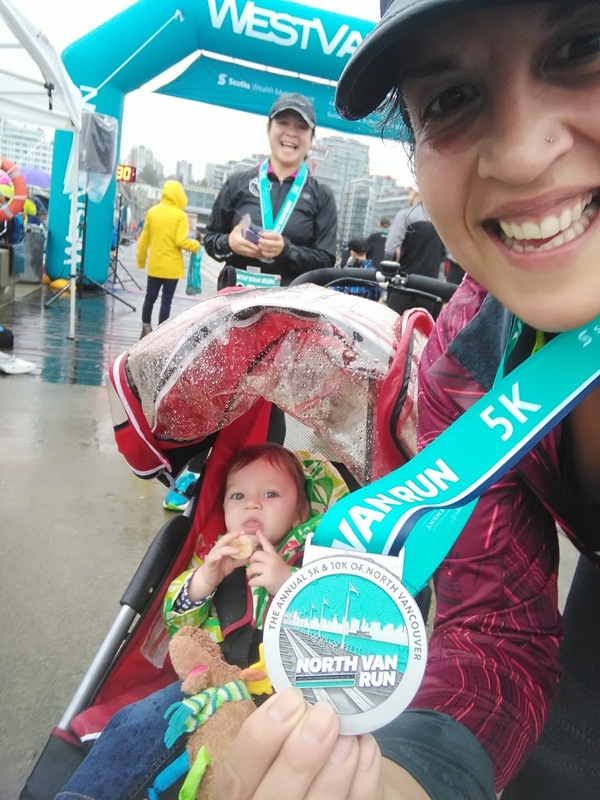 I ran through 37 weeks of my pregnancy, running with the baby in the stroller only seemed like the natural progression of things. Since I most often run on my own, having some cute company would be super welcomed. I hoped that I would have a little one who would be patient with me or even enjoy going out for workouts with me so that I can continue with my training schedule even if I am on parenting duty. I always admired the moms and dads at races lining up to race with their babes in a stroller and thought to myself, I hope that will be me someday. 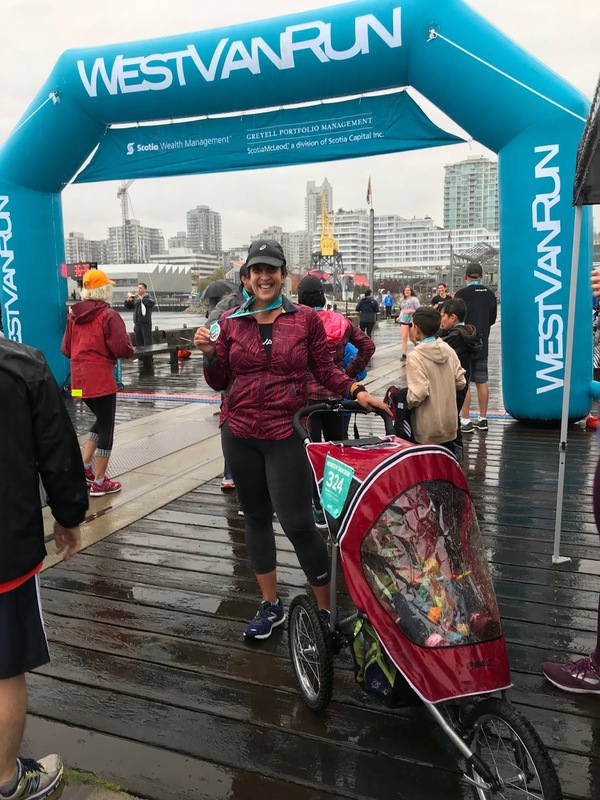 So I was pretty pleased to have found a really great jogging stroller on sale second hand on one of my social media running groups. The dad who sold it to me even delivered it to me since he didn’t want me to have the hassle when I was pregnant and ensured I understood how it all worked. 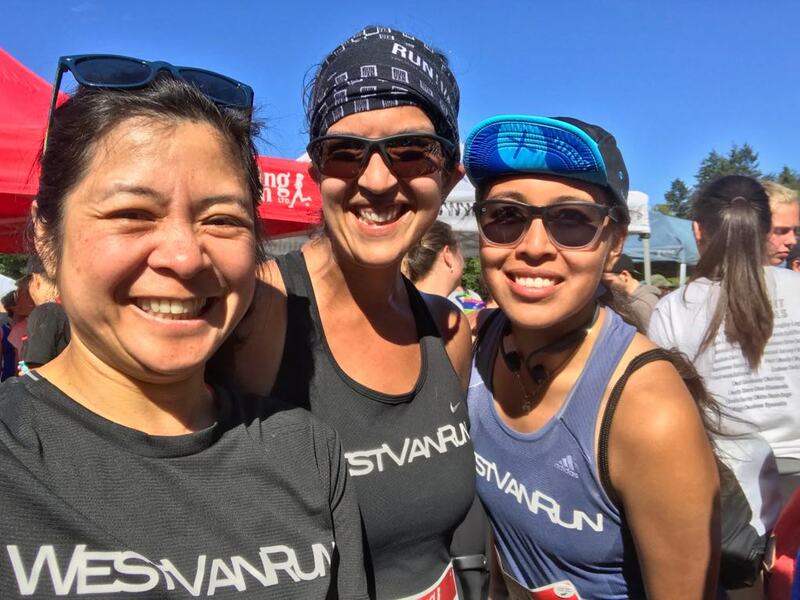 Gotta love the running community: it’s full of such friendly people. I pounced on the good deal but knew it would be a long while before it would get any use. So it sat in the corner of our condo dismantled for months as I waited to have a baby who was old enough for it. I knew I wouldn’t feel comfortable using it until at least 6 months of age and not before baby could sit up unassisted. When we finally reached those milestones, I was out with an injury. Upon my return to running, I wanted to return to running on my own before going out with a stroller. 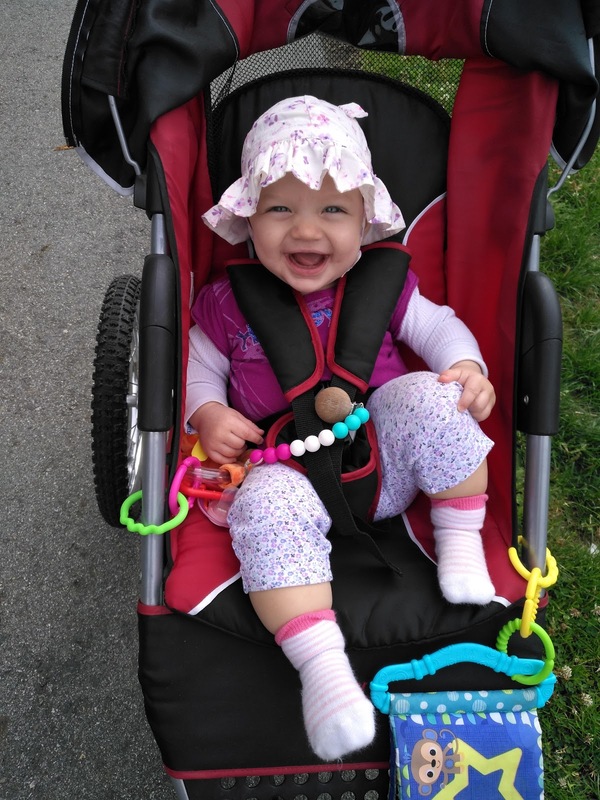 My daughter was about 8 months old when we finally got the stroller out of storage and were ready to hit the road. Now I needed to know that she’d like the thing, and all this waiting was worthwhile. So I first took her for a walk to our local bike shop to get the hand brake adjusted and air put in the tires, and she screamed her head off as I strapped her in. Thankfully once we got moving and out the door, she was fine and clearly enjoyed her new ride. It just took a little getting used to. Yes! 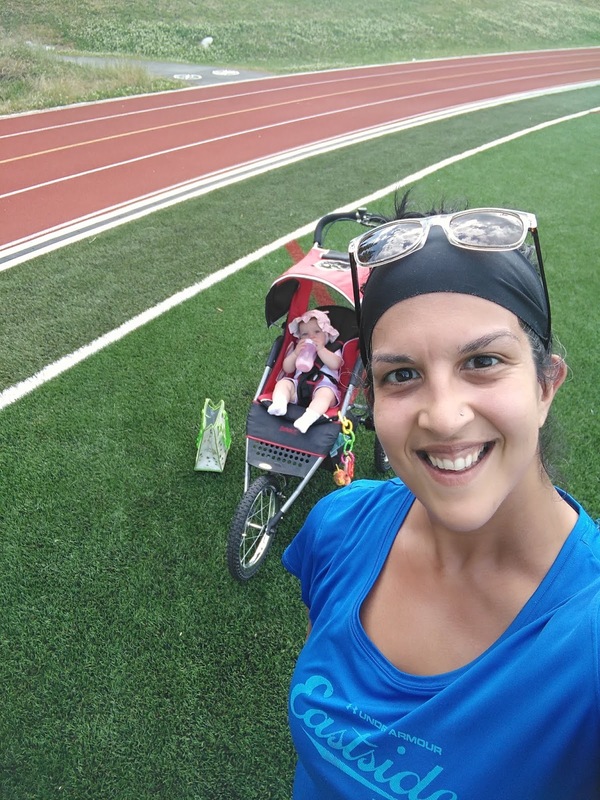 Now we run at least twice a week using the stroller and I am so very happy to report that my daughter loves joining me for workouts. I am so grateful for this because it allows me to have a bit more control over my training schedule as it doesn’t require someone else to watch over her every time I want to hit the road. I can go whenever I have an appropriate opening in my schedule. I also see this as setting a positive example for my daughter on how I prioritize and value an active lifestyle. And over the years, this time together will evolve. I can already imagine running with my daughter riding her bike beside me, and then one day when she's ready, RUNNING with me! All smiles during our workout this morning! As with all things with a baby, they are predictable in their unpredictability. I assume I will get out the door at least 2 hours after I've woken up in the morning. I have to make sure that both of us are fed and dressed, and that I have all the baby gear available in the stroller basket should something come up along the way. Bottles, diapers, food, toys, soother, hat, sunscreen etc. If I time it well, our workout will lull her to sleep in the stroller and that morning nap has taken care of itself. I've come to realize though, if I tried to squeeze a workout in on an already busy day, it likely won't work. So even if it's just a quick half hour workout planned in my training schedule, I will only go about it with baby in the stroller if we have the whole morning available. Because I have to ensure she's fed and possibly tired enough to fall asleep on the ride (rather than so tired she'll be cranky), timing has to be right. And I also have to factor time in as when we get home, it might be a while before I can get her settled down enough so I can have a shower and a recovery meal without stress. If I'm lucky, she'll fall asleep near the end of the workout and I can shower and even prepare lunch right when we get home in complete silence. Or it might be like today where she was wide awake and giggling the whole workout but cried and cried when I showered because I left her alone in her crib and she was not yet sleepy. Don't worry, we resumed playtime as soon as possible after! 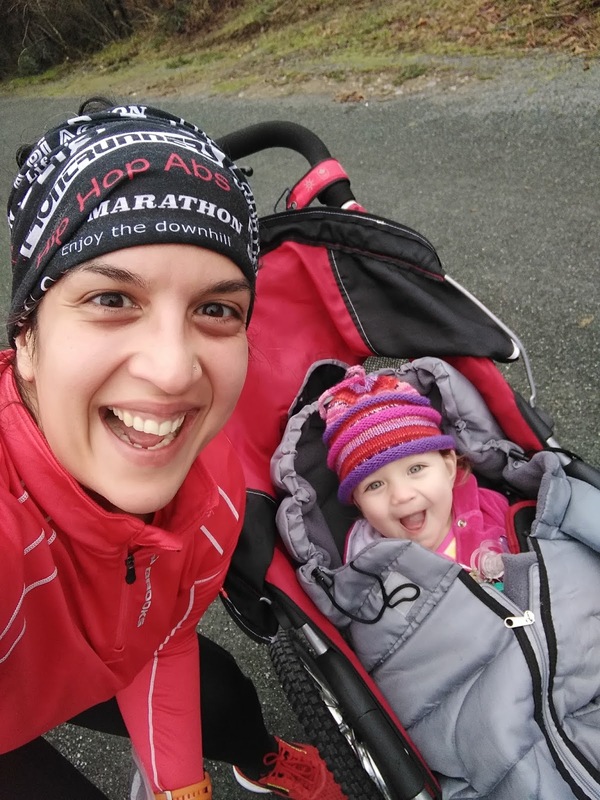 These are all considerations that are new when running with a baby rather than running solo. She's the boss over my time. Pushing a stroller while running is hard work! I expect to go a lot slower as a result. And because of what I described above, I am prepared to have to stop during a workout even if I don't need a break because baby needs a bottle or something else from me. I expect when she's older, I might need to stop a workout to let her play in a playground a little while. The outing is for both of us, not just my own training purposes. So it might not be the longest, fastest, or otherwise most ideal workout. But it is indeed a GOOD workout no matter what and a great way to spend time in the fresh air with my little one. I pay no attention to my pace or elapsed time on a workout when I look at my workout stats because I know that the stroller makes me slower and that I likely made stops along the way that I wouldn't have otherwise. It is not an accurate gauge of my fitness. I only look at the distance we covered. 3) Run without a stroller at least once a week. I have noticed that since I have been running with the stroller most workouts now, whenever I go without, running seems so much easier, and so I can push myself harder. It's great for my confidence indeed, but I also realize that running with a stroller and also without a stroller, doing both of these things is making me stronger. 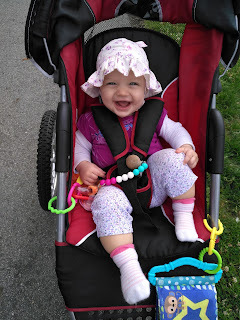 Running without the stroller is a good gauge of where my fitness actually is. Without the added weight to push or unplanned stops along the way, it's on these workouts where I pay attention to all my stats. Ensuring I do this at least once a week allows me to see the progress I am making and to adjust my goals along the way. Also, with a stroller, your gait is different than without, so it's good to mix things up so ensure that you're getting the balance your body needs. 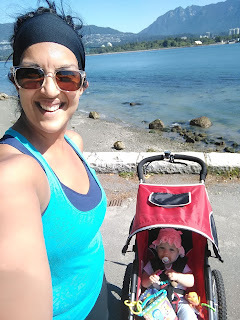 I have generally been doing shorter workouts with the stroller and saving long workouts for when my husband is home to take care of the baby so I can go out alone. But that's not always the case as we're planning on doing a long one this weekend with the stroller. 4) Pay attention to your gait. No question, your gait is different when you run with a stroller. I am very conscious of this as I want to be as balanced as possible and avoid injury. I want to ensure that running is still as natural as possible despite pushing weight ahead of me. I have a tether attached to the stroller which I wrap around one wrist and I alternate between pushing the stroller with two hands or with one. 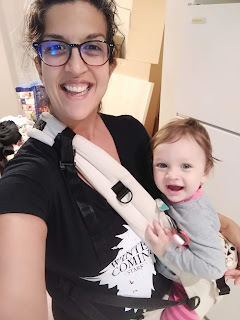 When using two hands, I tend to have to lean forward a bit more than normal, whereas using only one hand allows me to straighten out a bit and run closer to the way I would without a stroller. I use two hands when we are going uphill, when we are needed to slow down or stop, or when there are turns that require steering (rather than natural curves to the road). I use one hand only when I have some good momentum going, knowing that the other hand is still holding on using the tether. And I alternate which hand I use on the stroller vs. off the stroller so I'm not over-swinging one side of my body. Again, trying to achieve balance as best as possible. 5) Pick your running route carefully. One of the things I love about running is the ability to do it anywhere. You can literally step out of your front door and go. 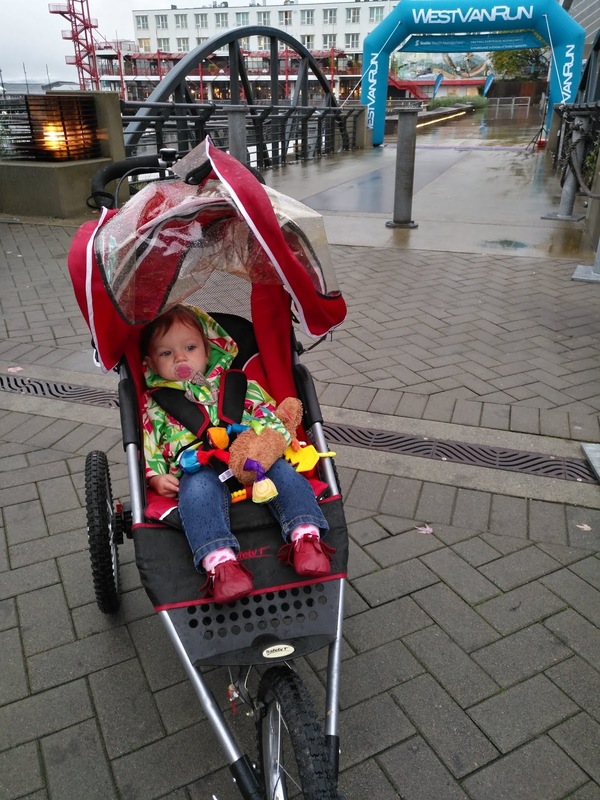 With a running stroller, it's not so simple. Sure you could run along your neighbourhood sidewalks, but I don't particularly like this approach. It's not so much about all the ups and downs of the curb, as my jogging stroller has good suspension, but it's because of the narrowness of the paths and having to share with other pedestrians that aren't expecting us to be coming along at some speed and requiring space to get by. It's also things like untrimmed hedges, sidewalks that end, hidden driveways, drivers that aren't paying well enough attention, and so on. So I've been mostly using the paved green-way near home. I can access the green-way by walking a couple blocks and then going down a steep ramp, so our workout starts after a little 10 minute warm-up walk. We've also run on our local track. 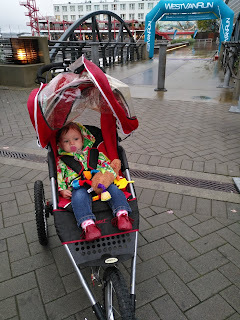 Or I pull the wheels off the stroller, throw it in the car, and we pick a paved path elsewhere to run like the miles of seawall available to run in Vancouver. The benefits of this approach is that there is width to the path we run so we can easily and safely pass other pedestrians, and we're likely needing to get on and off a curb or stop for traffic a lot less often. Less stopping means better momentum for a smoother, faster, and overall more enjoyable ride for both parent and babe. Post-workout selfie (and bottle) with baby after our first track workout together. 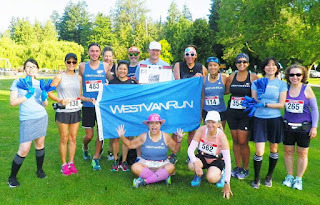 We have a big stroller run planned for this weekend as I prepare to run a 10km race on the 21st (without the stroller). Wish us luck! I know what you're thinking. 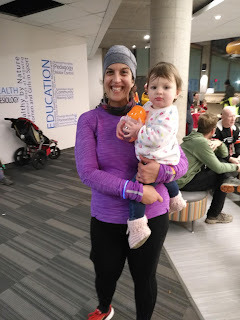 What does breastfeeding have to do with running and why am I writing about it on a running blog? 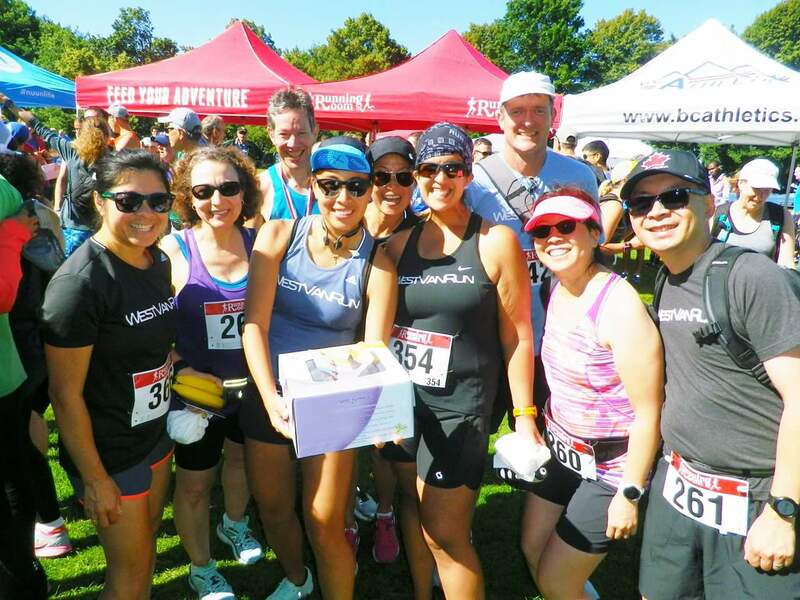 Well, running and breastfeeding have something in common - they require my body and require effort. And I never knew until I started my journey into motherhood that they actually impact one another. Also I know that a lot of my readers are women, some are mothers, some may be mothers some day. Perhaps you might appreciate my insight and learning about my journey. But really, I need to write about this topic, use my blog as an outlet, and document how I am feeling today. I need to do this for me. My daughter is now 8 months old and thriving. She is crawling, standing, babbling, and showcasing her hilarious sense of humour. Our 8 months together have been blissful, but challenging. Nobody can possibly prepare you for the challenges that you'll face in parenthood. I never realized how hard breastfeeding would be. I thought about it before and couldn't understand why women struggled with it and almost dismissed breastfeeding struggle with a "so what?" shrug. I just didn't get it until I was neck deep in the struggle, wondering if I would drown. It almost broke me on several occasions. It was the hardest part of parenthood so far. Why? Because I couldn't do it. Well I could, but only a little. I felt like my body failed me. I felt like I was failing at a basic function of motherhood. I was not able to do what was "best" for my baby. Sure I had a lot of factors that were working against me. My late start at breastfeeding when my daughter was getting phototherapy for her jaundice after birth didn't help. My age and health history didn't help. And other things I won't get into here, they also didn't help. I had a lot going against me. I tried everything from seeing a lactation consultant, prescription medication, power pumping, expensive herbal supplements, lactation smoothies, lactation cookies, lactation blah blah blah.... nothing worked. Well, the medication helped a little but I never got to a place where I could breastfeed exclusively. I felt good knowing that she was getting some milk, but the rest of her sustenance had to come from formula and I had to be OK with that. I had to remind myself daily that my body didn't fail. It made the best thing in the world that I have - my precious daughter. I am no less a mom. So yes, my girl was being fed and growing, and developing, and being amazing. In my head, I knew and know today that the fact that she's being fed is all that matters. But every time I made her formula, my pride and ego would take a hit. I felt guilt or wondered if there was something I could have done differently or better so she could get her nourishment from me. Or I'd feel good about our journey and then go out to a mommy and baby activity and see other women so effortlessly breastfeed their child, while I had to deal with mixing formula and heating a bottle to the right temperature for my babe. I would feel shame and imagine judging eyes on me. I know now that it's all in my head. Maybe the looks were just out of curiosity or admiration. I was feeding my baby and being the best mom I could be. My attitude changed when my baby turned 6 months. I finally realized that she was fine despite our challenged journey. I made it to 6 months and felt so proud of myself. While I in no means achieved exclusive breastfeeding, I was able to provide about 1/2 of her nutrition for 6 months. I realized, though, that there was a cost to me, and I had to do something to back off and be kinder to me. We started to change our feeding relationship, only nursing in the morning and I pumped the rest of the day. It was lovely to still have that bonding in the morning that only nursing can give. However, it proved difficult to maintain that routine when we went on our family vacation to Maui. With the time difference, her feeding schedule and my production schedule didn't seem to sync up nicely anymore, so we moved to pumping throughout the day. This included pumping on the plane and in the passenger seat of the rental car, in order to keep with my schedule. The last time I nursed her was in bed in Maui one morning at around 5am, and it was one of our most lovely experiences with this relationship. I will always remember that time fondly and I am at peace with that being our last session. Pumping for your baby is no joke though. Every half hour spent connected to a machine means time you can't parent fully. You can simply put your baby somewhere safe and engage with her at a distance. When you have an active baby who wants to hang out and play, this can be hard to achieve. You have to sing when she starts to cry, ignore her when she's clearly pooped her diaper or is asking for something you can't provide, all the while try to relax so your milk will flow. Then when you make plans for your day but realize that you're approaching the deadline to pump (or be uncomfortable), you cut your perfectly good outing short to come home. Despite these challenges, I continued this routine for 2 months. I would have continued to do this right until I returned to work, perhaps, but I had a scare about a week ago. I have been on prescription medication from the beginning, and apparently the effects of the medication can be multiplied if you eat grapefruit. I have been avoiding the fruit although it's one of my absolute favourites (I consumed it daily when pregnant - no joke). I accidentally ate some when visiting a family member who made a beautiful salad and this resulted in frequent heart palpitations for two days. I made an appointment with my doctor and she reassured me that my heart was OK, but this might be a good time to consider weaning. At 8 months, my daughter is a champion eater and will rely less and less on milk over the coming months. If I have to take drugs that can impact my heart to feed her, is it worth it? I think not. So we've started the process and so far so good. Well, except for the mood swings and meltdowns (on my part). I am almost there. It hasn't been easy to make that decision. Breastfeeding might seem trivial to those who haven't embarked on the journey. It certainly did to me, admittedly, until I became a mom and the challenge hit me square in the face. I think the reasons why the journey is so challenging if it doesn't go according to plan is twofold: (1) we want the very best for our babies and breastmilk is excellent nutrition and full of a mother's antibodies to help baby develop their immune system and (2) after growing a baby in our bodies for 9 months and then giving birth, breastfeeding is the one remaining way of keeping our bodies connected. My daughter is literally part of me. I have many helpful mommy friends who have said the right thing at the right time to help me through this journey. I hope you read this and see how much your support has helped me. To my dear friend who couldn't breastfeed and chose to exclusively formula feed, thank you for helping me understand from the very beginning that "fed is best" and that formula is wonderful nutrition for a perfectly healthy baby. I thought of her and her beautiful son every time I struggled with preparing formula for my girl. My sister-in-law who was able to breastfeed her three babies (perhaps with struggle of her own that I don't know about) reminded me that breastfeeding is not better than combo feeding or formula feeding. It's simply different. And my best friend who is a mother to three as well told me that even though I could only feed my daughter partially for 8 months, my effort to do the best for her was the furthest thing from partial. Thank you! So I suppose saying that I "quit" is too harsh a comment. I made a choice and one that is right for me, and as a result, best for my child. Quitting suggests that adequate effort wasn't put forward. It connotes that perhaps I should have tried harder. Although sometimes my heart pangs with these inaccurate sentiments, my mind knows better and tries to correct it. I indeed tried and tried harder at this than almost anything in my life. And that says a lot since you know me, my work ethic, and my journey to become a runner. Don't tell me there's something I can't do, because I will do everything in my power to prove you wrong. 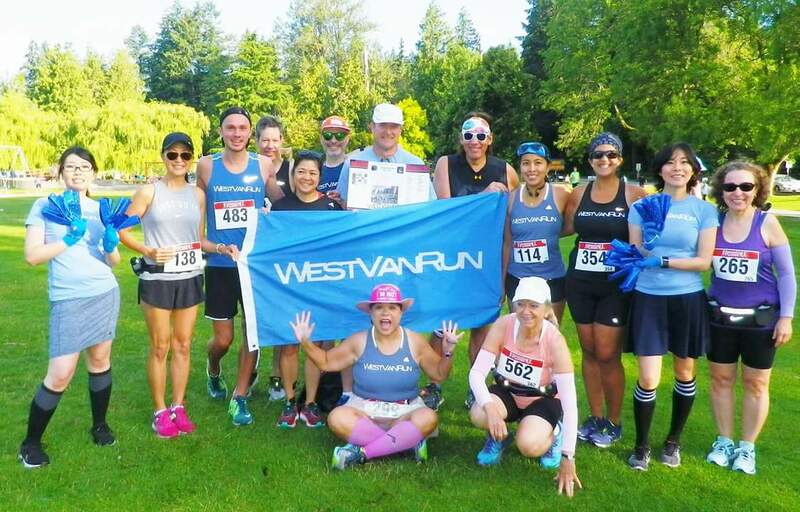 What does this journey have to do with running? Everything, really. 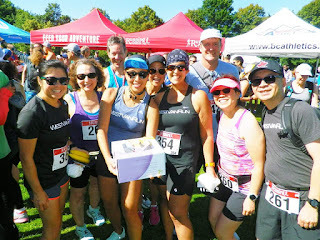 Imagine my breastfeeding journey as a race, an extra-grueling, ultra-marathon, with absolutely no finish line in sight. 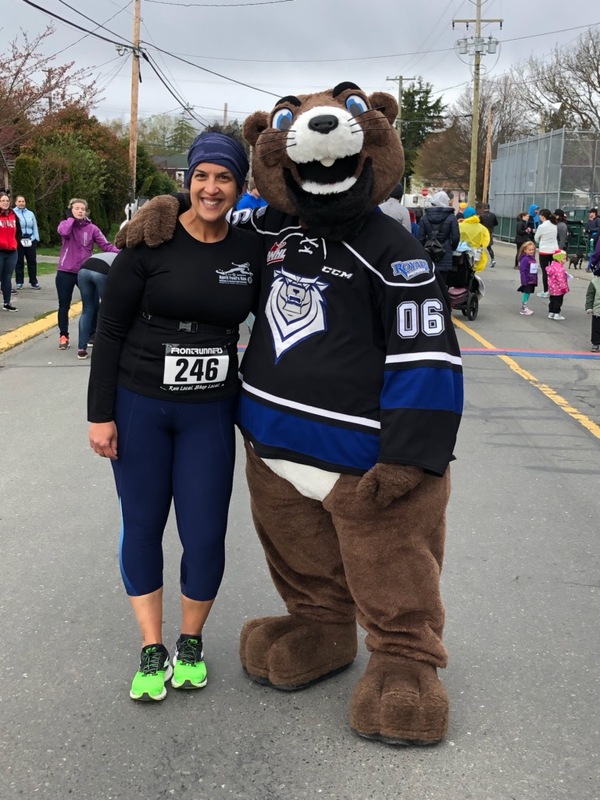 During the race there are sleepless nights, physical pain, and a young child who you love more than anything needing you, begging for you, but you're not able to be there for them, because you're busy running a race. And it's not like you're winning the race; you're somewhere in the back of the pack, struggling to hang on, wondering if you're going to finish last. It's no wonder that 8 months into this race, I would want to start walking, or perhaps, take a seat on the curb for a while. Or call someone to tell them to pick me up and take me home. And tell me it's OK not to "finish" because my journey had already been admirable enough. 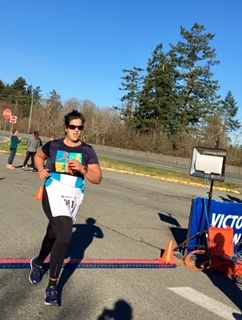 Scoring a "DNF" in this journey (Did Not Finish) is too harsh here because I believe that the part of this race I completed had a very positive impact on my daughter's health, and it's an accomplishment I should feel proud of. Someday I will be ready to be proud of myself, fully. 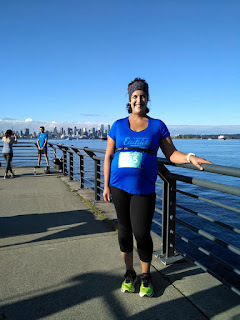 And soon, my body will be entirely free of this, my hormone balance will regulate again, and certain characteristics of the woman and the runner I was before I became a mother will return. I will not be the same, nor do I have any desire to "get my body back" (I never lost it! ), but I do expect that over time, having a balance in hormones will allow some changes back to what's familiar. It will allow me to lose that last bit of "baby weight" I haven't been able to as the body hangs onto fat stores in order to make milk. No, breastfeeding isn't the miracle way to lose weight folks. That is a lie (at least it isn't true for every woman). My body will still have a different shape and evidence that it housed a baby at one point, and that's OK with me. I've never had flat abs anyway, so why stress about something unattainable, and frankly, entirely unimportant. But losing weight will help me as a runner, both because it'll put less stress on my joints, and because I will be able to go a bit faster than I can now. I am most excited about relaxin working its way out of my body, the hormone that allows the body to change shape to accommodate and birth a child. It's likely what was responsible, in some way, for my knee sprain that benched me for 6 weeks. 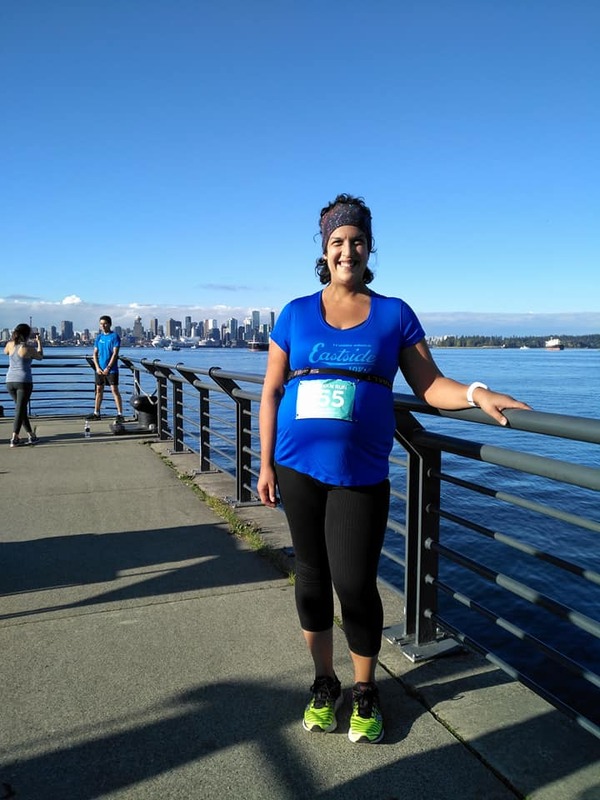 I have heard from other mother runners that after they stopped breastfeeding, their joints gradually began to feel stronger and more stable again. But it'll also free me up from something that has been so hard on me emotionally and taken up so much of my time. I know longer have to schedule pump sessions and factor that in as something to do before any scheduled run. With my mind freed of this burden, running will just be so much better! We did indeed reach the finish line! 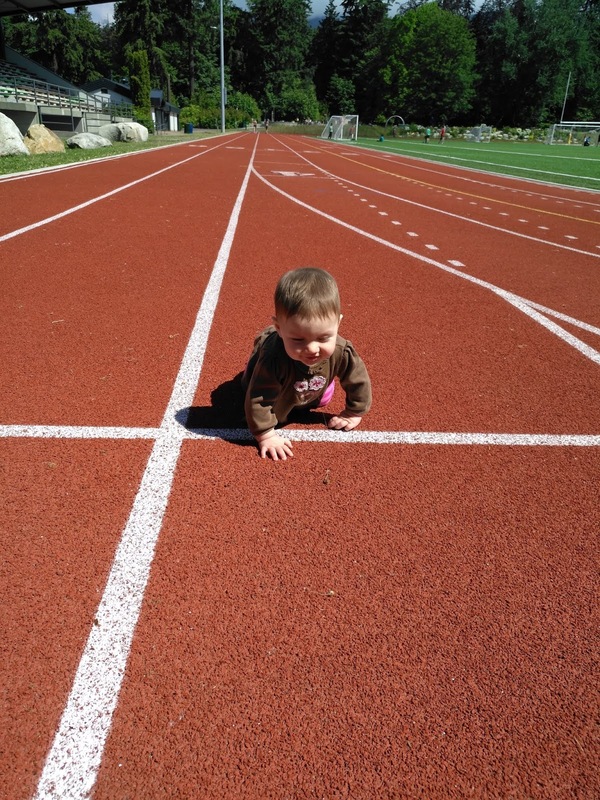 My daughter crawling across the finish line at our local track. So there you have it - I hope you have appreciated my candor here. I have appreciated all the positive comments, private messages, and emails I receive about my blog posts where I speak about such personal topics. Thank you for being an audience and a support. My last post was written almost exactly one month ago and was titled enthusiastically about my return to racing after an awesome month of March. Now here I sit at my computer injured. In fact, I have been hurt since about two days after that last post was written. I was in denial at first, and optimistic that it would be short-lived. I thought for sure that I would not miss the April Fool's Run, as I never miss that race. I've been doing it every year since 2012, including last year when I was pregnant. So what was a little injury? I didn't realize how hard I hurt myself until I went to see my physiotherapist and the simple exercises she assigned me to do were so very hard. If I can barely balance on the hurt leg for more than a few seconds, how do I expect to run 10K which is essentially thousands of repetitions of balancing on one leg over and over with no break? I was in denial because I don't really know what I did to hurt myself. There was no one defining moment where I fell or twisted wrong. I just didn't feel good during a training run but got through it anyway, and the getting through it anyway thing was the worst thing I could have done. My knee stiffened up more and more as the day progressed, and my whole leg got very angry until I could barely move it. Despite this, I decided that it couldn't be a bad injury because I have never hurt my knee. There's a misconception that running is bad for knees and I cringe when people ask me if running so much has ever hurt my knees. Well, it did now, but this is after running for 8+ years and thousands and thousands of miles with zero previous knee pain. I think the combination of relaxin hormone in my system, a body shifting back to normal post pregnancy, yet still hanging onto a few extra pounds, plus shoes that were maybe at the end of their life worn a bit too long, and maybe a few other factors. There was no one defining moment, but rather numerous variables coming together like a perfect injury-inducing storm. The first few days were the worst because the pain was debilitating. I could barely walk and so taking care of my daughter was really a challenge. Having a baby is physically tiring with all the carrying, lifting, etc., done throughout the day. Holding her in my left arm almost all the time has meant additional stress to that side of the body, likely another factor in the knee injury. So having to continue to care for her with this hurt body hasn't helped recovery. I continue to stress my knee out every time I lift her or hold her on one side of my body while I do things with the other, dominant side of my body, which places me in imbalance over and over again as each day progresses. But the worst part of being injured is the missing out on everything part. I missed the Fools Run. I missed a weekend getaway to the Sunshine Coast with my family. I missed running with a friend. I have missed sunny day after sunny day this glorious spring where I could be training and wearing shorts! I have missed hiking invitations. I have missed social running opportunities. I have missed out on my favourite exercise and the ability to burn mega calories (which until now had helped me lose some of my baby weight). But also I find that when I run, I crave healthier food and I treat my body better. I am missing that and definitely feeling guilty about not eating super well this last little while. I have also missed out on my "me time" as I usually run solo and as a way to decompress and promote better mental health. I have missed out on something that is so me in so many ways, and I am absolutely itching to get it back. It isn't forever, but it's been a month, and while I have made progress and can walk comfortably, I know I still have a little way to go yet until I am running well again. I will have lost so much of my fitness and will have to start back ever so slowly as to not risk further injury. I won't be starting with 10Ks and working up to a half marathon. A half marathon this fall might be too ambitious. 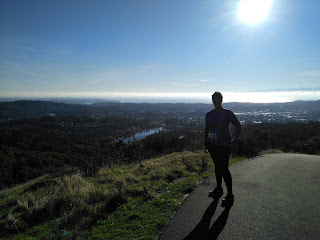 I will be starting at the beginning all over again, just like I had to returning to running post-partum. Slow, steady, and boring. So while I am so discouraged, I also know that running will always be there for me. I didn't ruin my knee. I have an injury that I will overcome. And when I can return, it will feel oh so very sweet. I will do all the wonderful things I wish to do as a runner. It just might not be in the timeline I had hoped for. But it will all still happen. Until then, I just need to find other ways to keep myself grounded and better focused on healthy habits. Until then I simply need to keep my chin up and keep working at getting stronger. Eyes on the prize!